Advanced tickets for this concert are all sold out. In case tickets become available on the day of the concert, they will be on sale starting from 1:55pm. 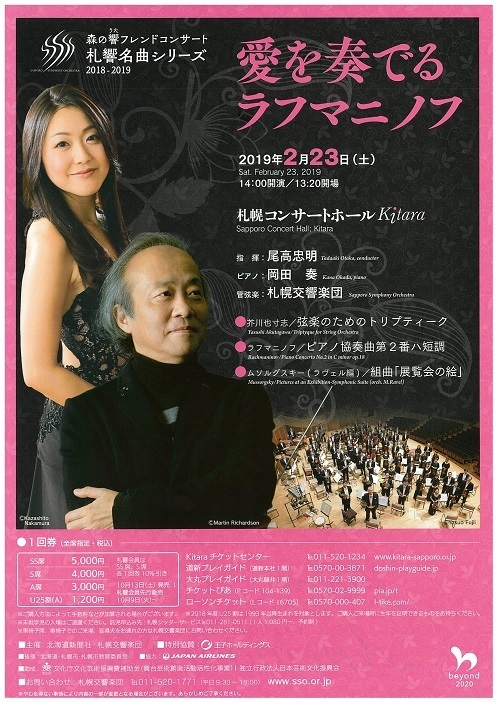 In order to get these tickets, Sapporo Symphony Orchestra will deliver numbered coupons, which will be delivered from 1pm at the Kitara Box Office. ※Kindly understand that we can give no information on the seat class or number of tickets be available. ※Numbered coupon cannot assure you that you have a right to buy a ticket. Hokkaido had a strong earthquake last night, February 21. Sapporo Symphony Orchestra has not suffered any damage from this, and we thank for your concern. Sapporo Symphony Orchestra would like to express a deep sympathy to those who suffered from this earthquake.